A saline pool Tesla stations and in-room kitchens hint at the pluses guests find at the non-smoking Home2 Suites by Hilton Rock Hill. All 108 rooms at the four-story Home2 Suites feature full kitchens sofa beds flat-panel LCD TVs and free Wi-Fi. Shop for goodies day or night in the 24-hour market and don't forget to grab a bite from the complimentary breakfast buffet. A year-round indoor saline pool and a fitness room are on hand for active types while the business center buzzes for worker bees. The hotel also offers Tesla charging stations plus free on-site parking and airport shuttle service. Pets are allowed for a fee. 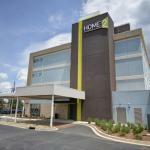 The Home2 Suites is surrounded by dining options a half-mile south of the Rock Hill Galleria. The heart of Charlotte 24 miles northeast is home to the Spectrum Center Discovery Place Science and the Charlotte Convention Center. Techies are four miles from Knowledge Park while family fun abounds 13 miles north at Carowinds. Guests are also 25 miles from Charlotte Douglas International Airport.